1. Login to your petition, and in the dashboard section of your petition click "Declare Victory"
2. Tell us briefly about your victory and how you created change. For a chance to have your petition featured on our homepage, be sure to tell us what you did to win! Help us verify your victory by posting links to any media coverage you received. If your petition received less than 5 signatures, you may not be ready to declare victory. You’ll be directed to a notification instead with ways to grow your signature count. 3. Thank your supporters in your victory post, and let them know how much you appreciate their help! 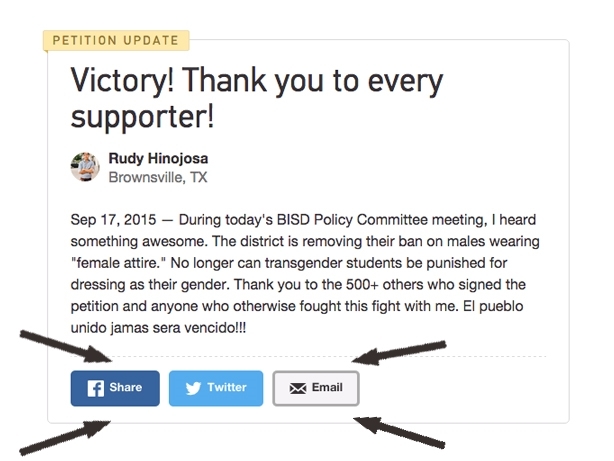 We’ll send an email that is sent to all your signers with your post telling them about your victory and the post will be featured on your petition page.